Trojans U11's winners of the Copa Jordi tournament, which took place in Barcelona. Trojans chairman Raymond Cartonsaid he is still on ‘cloud nine’ after the club’s U11 side created history last week. The local youngsters defied the odds to secure a European title when they won the prestigious ‘Copa Jordi’ tournament in Barcelona. “To be honest I’m buzzing as much as the kids are and I haven’t come down from cloud nine yet,” joked the Trojans Chairman. “This is my 43rd year involved with Trojans and this has to be the highlight. The local lads toppped their group after defeating Swiss side FC Vernier 5-1. They had a 3-0 win over French club Lavaur before beating Italians Saurorispescia 4-1. In the semi-final, Trojans had a comfortable 6-0 win over French side Gemenos before defeating Germans Viktoria Berlin 4-2 in the final. “We just took the one team out this year, a few years ago we had three teams competing in the competition. This year we just concentrated on this one age group. “The whole experience was great for the team. They played two French teams, a Swiss team, an Italian team and a German team in the final, so they came up against multi-national sides. Having brought the likes of James McClean and Kevin Deery, to name but two, through the Trojans set-up, Carton believes there are a few players in the 2007 age group that have a chance of making a career for themselves from the game. “I would think that some of that squad will go on and play senior football, because it’s a talented bunch in that age group,” he said. “There are possibly six of them who I feel, with the right development and the right attitude, can progress. 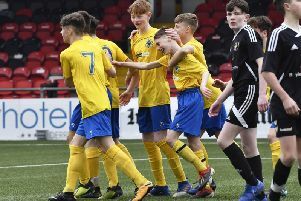 “The Foyle Cup tournament experience does help the squad, but the Copa Jordi competition has sides from all over Europe, so that was a totally different experience for the boys though the whole experience was fantastic,” he added. “There was 16 teams in groups of four in our section and the winners of each group went into the semi-final. There were hundreds of teams in various age groups taking part in the competition. “We played a very strong German team in the final. They were a physically strong side who had gone through their quality group unbeaten, the same as ourselves, and they scored a lot of goals but while they were physically stronger than our team, the lads rose to the challenge fantastically.